Recommended Citation: Nepal, T and D Petkov. 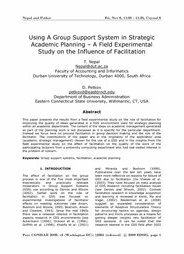 Using A Group Support System in Strategic Academic Planning – A Field Experimental Study on the Influence of Facilitation. In The Proceedings of the Conference on Information Systems Applied Research 2009, v 2 (Washington DC): §2365. ISSN: 0000-0000. This paper presents the results from a field experimental study on the role of facilitation for improving the quality of ideas generated in a GSS environment used for strategic planning within an academic department. The content of the ideas on academic management generated as part of the planning work is not discussed as it is specific for the particular department. Instead we focus here on process facilitation in group decision making and the role of the facilitator. The contributions of the paper are in the originality of the application area (academic strategic management) chosen for the use of a GSS and in the insights from the field experimental study on the effect of facilitation on the quality of the work of the participating lecturers from a university computing department who had real vested interest in the problem of concern.